Here I am – pulling out one of my finished quilts. Just becouse I would like to participate in Blogger’s Quilt Festival hosted by Amy Ellis. 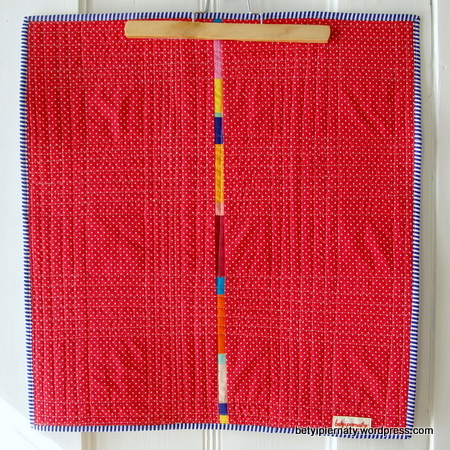 Niniejszym zgłaszam mój mini quilt. Kolorowy, złożony z ćwiartek bloku log cabin. Do tego wesoły tył w białe kropeczki oraz pasiasta lamówka. I pikowanie jak-cię-mogę. This is my mini quilt. 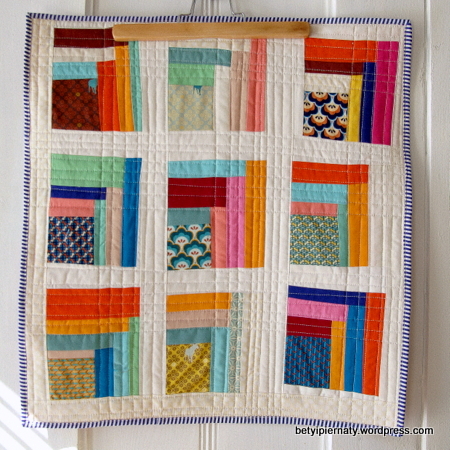 Fun and colorful, with improv quarter log cabin. Back is full of small white dots on really bright red, with colorful line (from front’s leftovers) in the middle. Quilted as you go. Really fun to make.